Sauerkraut Recipe: It Can’t Get Any Easier for the Perfect ‘kraut! A fermented sauerkraut recipe and directions for home canning. Canning sauerkraut involves several separate steps so you might think it will be hard, complicated messy! It is actually pretty easy. Just take one step at a time. It is a lengthy process, it won't be over in a day. But when you are done..... oh my! The best sauerkraut you can imagine. Doesn't even compare to the stuff in the cans from the store. Sauerkraut is a fermented cabbage. It is the only way it has been tested as safe for storage in jars on a shelf. Remember this is not plain cabbage, don't skip the fermenting part. Find some nice fresh healthy green cabbage. Remove any outer leaves that are damaged or are wilty. Core the cabbage. The easiest way to do this is to first cut the cabbage in half just to one side of the stem. Then cut the piece with the stem in half again just to one side of the stem. One more cut down the side of the stem should take the core right out. Next you will need to slice the cabbage into sliver thin shreds. I use a mandolin slicer, you can just use a knife, a food processor or what ever tools you have. Weigh this cabbage. If you have more than 5 pounds, separate out 5 pounds and place in a large bowl. Mix in 3 T salt. Mix well, tossing and getting the salt spread out as evenly as possible. Do this again with your next 5 pounds of cabbage. You want to mix in 3 T salt for every 5 pounds of cabbage. Let this salted cabbage sit for a few minutes. This will cause it to wilt and soften. It also makes it easier to pack into your jars for fermenting. Pack tightly into jars. I had 3 heads of green cabbage and ended up with 2 half gallon jars and one gallon size jar. Pack it tightly with a wooden spoon or a kraut pounder. I recently got a kraut pounder. It is so much easier! I've used a spoon in the past. It does work. But the flat end of the pounder pushes the kraut down much better. It is called a pounder... but if you let the cabbage wilt before you try to pack the jars, you really don't have to pound. Just a solid pressure down packs it nicely. As you press the cabbage, juice should be rising to cover. Stop packing when you are 4 inches or so below the top of your jar. Right around the shoulder of the jar. If you don't have enough cabbage juice to cover, add some brine to the jars so the cabbage is completely covered with a couple inches of liquid. Brine Recipe - 1.5 Tablespoons salt to 1 quart water. Just bring this to a boil and let cool. Now for the fun part. The wait. Cover your jars. This time around I tested out a new fermenting lid, my airlock (which I've used before) and simply covering in cheesecloth. I've got a review of the 3 lid methods and my favorite here. Weight your cabbage down with something to keep it below the brine level. Cheesecloth works but not nearly as well as other fermenting lids. I've also used a saved leaf from the cabbage itself. Pickle Pebbles are another product that I have that work pretty slick. If you are using a crock, try using a plate that will just fit inside the crock close to the edges. Don't forget whatever you use to place something on top if it wants to float. The goal is to keep the shredded cabbage submerged. Pickle Pebbles. Round glass weights for fermenting. The simplest method if you don't have handy weights, is to place a small water filled jar inside the fermenting jar on top of the cheesecloth or cabbage leaf or plate. This needs to be stored in a cool place for 3 to 6 weeks. As it sits and ferments bubbles will form, that is normal. You may need to press down on the cabbage again to keep it from floating and peeking out above the brine. Keep it covered. This prevents oxygen from getting in. Scum may form on top. That is also normal (though icky). This scum should be skimmed off daily. It should not smell 'bad'. It will smell ferment-y-ish, and well.... like sauerkraut. This is why I would recommend you consider using one of the choices of fermentation lids that are available. When I use these, I don't get any scum. To me that makes them worth the purchase. See the link to my review of a couple different kinds above. Once your kraut is done you have two choices. Process this to store on the shelf in jars. Store this in a refrigerator. Remember this is a fermented product which has all kinds of great health benefits. Probiotics which are great for the gut. 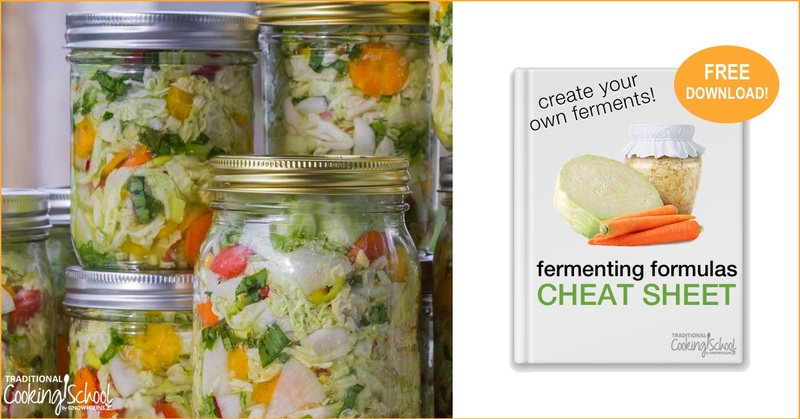 Scroll on down past this section if you want more information on Fermenting only. It is a simple matter to can it so you can store it on the shelf. You can also just place the jars in the fridge. To can it simply heat your sauerkraut to a boil. Pack the kraut into pint or quart size jars leaving 1/2 inch headspace. Wipe your rims clean and place your lids on the jars with the screw bands. Process in a waterbath canner. This cabbage product is safe for the waterbath only because of the fermenting you have done. Please don't adapt this to unfermented cabbage! If you are interested in fermenting your food for health reasons and don't want to process your food in jars for shelf storage, you must check out Traditional Cooking School. Here is a cheat sheet download she created to help you with a variety of fermeting projects.